Perhaps in the excitement of the elections in the USA this year, many people are less aware that another presidential election is taking place on the continent - in the neighboring country of Mexico. Campaigning ended on Wednesday, and the election itself will take place tomorrow. All indications are that Enrique Peña Nieto, candidate for the opposition PRI, is highly likely to win, ending 12 years of presidency by PAN. 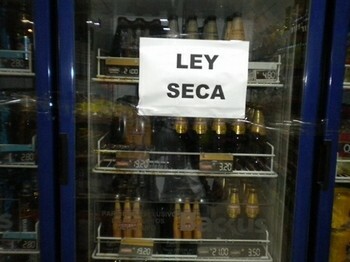 In fact, the federal 'Ley Seca' in Mexico was repealed in 2007, the year after the last election, and it is currently up to the individual states to determine whether or not they will apply it. The majority appear to have decided to continue the tradition.